Some OT Fieldwork Advice can make or break your clinical experience. Sure, you will probably pass, but it is all about having a great experience! Naomi Aaronson, an OT who has been practicing for 25 years, has put together this guide to help you prepare and succeed for Fieldwork. Whether you are about to begin a Level I or Level II, you will certainly find some tips in this OT Fieldwork Advice. Brush up on the population by using evidence-based practice as well as “user-friendly “ articles that you can find here on NGOT to help prepare you. Learn as much as possible as you can about the site and the population that you will be working with. Fieldwork supervisors may not always up to date on the latest research, and you can educate them as well. Let this experience and learning be a two-way street! Try to schedule an interview with your supervisor prior to your start date. A face-to-face meeting or phone interview is a great way to identify expectations of the site and to evaluate if you will be able to meet those expectations. It is better to identify any potential problems prior to the start of Fieldwork to allow enough time to locate a new site if necessary. Take the time to iron out the logistics (transportation options, expected commute time, parking situations, etc.) prior to your first day, especially if your site is located in a metropolitan area. Being late on your first day is a quick way to get off on the wrong foot and can easily be avoided. Getting to your site early on your first day can also give you enough time to get composed, allowing you to present your best self! The night before your first day, take the time to pick out your clothes, make your lunch, and pack your bag with everything you may need (notebook, ID badge, pens, etc.). Try to get to bed early. Preparing these things the night before will reduce the stress in the morning, and will set you up to succeed on your first day! Take the time to observe and take in as much information as possible during your first days. Every site has it’s own rules, regulations, and norms to be followed. Try to take in this information without judgment. Instead, work to understand why things might be done in a certain way, and ask lots of questions. Try new things as much as possible. Be ready to jump in! We all want to be great at everything we do, but the best way to improve is to try, and if you fail, learn from those mistakes. Don’t be so hard on yourself! You will see things that may upset you, be directly opposite from what you learned in school, or conflict with your values. It is wise to keep your thoughts, opinions, etc. in the judgment-free zone. Things may not be as they appear. You must learn to separate your emotional reactions and feelings so that you can be an “agent of change” and be the best student therapist that you can be. For example, you may be in a setting that does not utilize the most up to date, evidence-based practice strategies. Instead of making the judgment that this placement is outdated and lazy, try to understand why the current treatment strategies are being used. Use your student project to present new ideas and information to help foster that change! 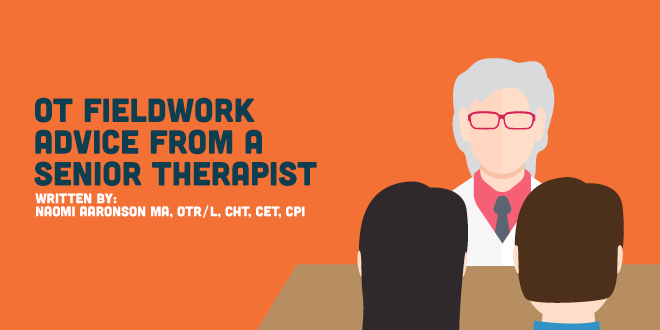 OT Fieldwork advice is crucial here because working in a non-traditional site can be challenging if there is no occupational therapist there. Staff may not understand what the role of occupational therapy is with their population. It is up to you to share how occupational therapy can address their patient’s needs. However, make sure that they are open to this by developing a relationship with the staff members at the site and demonstrating what activities can be provided. Share any thoughts or feelings with your OT fieldwork coordinator who can bring an OT perspective to the situation. Transitioning to fieldwork can be stressful. Find ways that you can minimize the stress such as using meditation, deep breathing, or exercise. These techniques may even be taught to your patients since stress is so commonplace these days! When you reflect on the day, try to identify one positive thing that happened, be it a moment shared with a client or a laugh with a coworker. The best OT Fieldwork advice is to take the time to appreciate the positives to help you cope with and overcome any challenges. Completing occupational therapy Fieldwork is a major accomplishment. It is based on many parameters that we cannot change. Your experience can be fraught with many minefields. Consequently, “going with the flow” can be a good mantra to follow. And don’t forget to take care of yourself! If you prepare yourself physically, psychologically, and intellectually for fieldwork, you can set yourself up to be the best that you can be!